When we draw a square we make it on the base of 2 specific spatial coordinates (XY). We can delete our draw and create another independent square of the same dimensions based upon any other 2 spatial coordinates. In both cases, our referential coordinates will be the same, X and Y. We can change the direction of our coordinates but it will not change our referential lengths. But if we create a square and then we trace a diagonal inside (or outside but taking that square as the starting point), we will have changed our referential coordinates. Our coordinates will not be the same, at that moment we will have introduced two kind of different coordinates X1 Y1, and X2 Y2 with different referential lengths. X1 Y1 (related to the square) are not the same coordinates than X2 Y2 (related to the diagonal) when we relate they both in the mentioned way (in a trigonometric point of view, that is, when it comes to a triangle created from a square – a right triangle). When you trace a diagonal from a square (of XY) you a are moving, spatially displacing, your referential XY coordinates. The referential coordinates of the created diagonal, then, are not the same XY, they are XY plus the spatial displacement introduced. The effect is the same than if we had expanded our workspace. Working with X1Y1 and X2Y2 in this combinatory way supposes to work with two different planes on the same shared space (or two different spaces of the same shared plane). And because they are different, they respond to different referential lengths. It is not possible to compare them directly if we want to get a rational result. It will be necessary to transform them to be able to compare them. It is the most elemental rule of the maths, we cannot compare decimeters and centimeters directly, we need to transform one into the other. 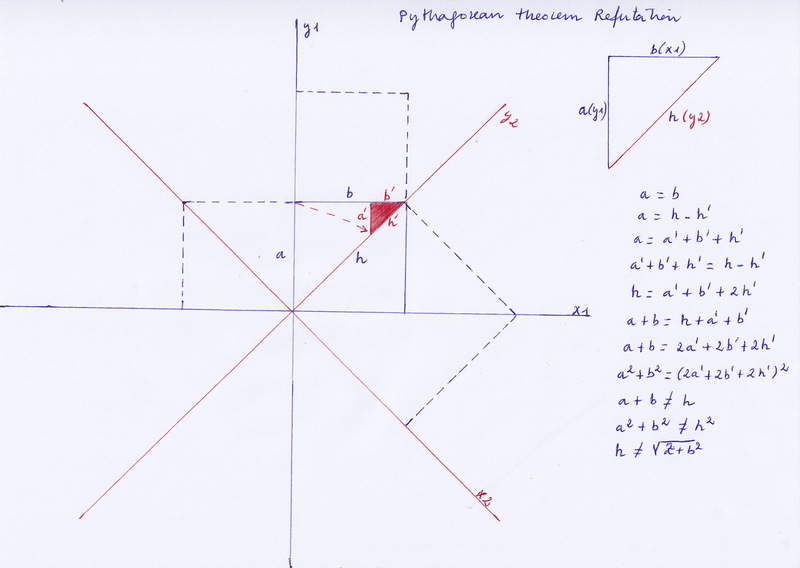 The formulation of the Pythagorean theorem, which constitutes the base of all trigonometry and most measures of our current physics, does not take in consideration that the result is got comparing areas of different nature, related to different references. Mathematical irrationality is the simple consequence, I think, of comparing things that cannot be compared directly. It is a bad solution to the problem of not be aware that when we trace a diagonal inside of a square we are displacing spatially or referential coordinates and introducing a new kind of referential lengths. For comparing the figures of those different kind of coordinates, those different planes of the shared multiplane or multidimensional, if you will, space, it is necessary to take in consideration the introduced spatial transformation. It occurs the same when we draw a circle and want to compare its diameter (related to XY) with its perimeter (related to multiple different and alternate XnYn coordinates). The area got on the Pythagorean theorem when squaring the hypothenuse is a multidimensional, multi-planar are, a hybrid nature one which cannot be compared with the areas got squaring the legs, independently that the result can be coincident or not. We should not leave aside rationality on our created models and languages. The possibility to know nature directly through our rational and logical common sense and our simple perceptions was totally discredited since the Copernican revolution in the European Renaissance. The Aristotelian thought, which has been the only accepted way to understand Nature and the prevalent worldview through many centuries, was entirely disabled for the new scientific approach, the very late triumph of the Pythagorean school. Aristotle had denigrated and rejected the Pythagorean view, recovered by Galileo, about the essential function of mathematics for finding out the secrets of the Universe. He had rejected the Pythagorean intuition of antimatter clearly represented by theory of the existence of an Antiearth, the named Antichthon, and a second and central sun. He had rejected too the idea of heliocentrism. Now, we (our science, our scientists, our western civilization descendent of the greeks) are still in the oposite side of the pendular movement, the fierce reaction created by the Copernican revolution against near twenty centuries of monolithic Aristotelian prevalence. So, our current science does not blush saying that nature is irrational, that it is ruled by randomness, that it is not necessary a specific cause to explain an effect, that our logical rationality is not any necessary condition to accept a scientific model which lets experimental measures or explains the already made, even if that model is a total nonsense from a rational perspective. Our science has given up on rationality and the reason always given is the same: The evident failure of the Aristotle worldview. Aristotle, I think, had their own good reasons for suspecting deeply and rejecting drastically the Pythagorean perspective. It was his own pendular reaction against a school who tried to convinced him about the existence of the irrationality. It is impossible that Aristotle’s rational mind accepted the irrationality appeared when comparing the perimeter and the diameter, the hypothenuse and the legs. Instead of looking for a rational and simple common sense explanation to the problem created for the combination of different referential planes, Pythagorean gave up the reason in favor of utility. They preferred to get an irrational solution and to go ahead. All our trigonometry has been built on that irrational and provisional solution represented by irrational numbers. All our current physics, atomic and astrophysical, and all sciences depending on it have been elaborated on that elemental mistake. Now we want to build huge computers to get billions, trillions, infinite if we could, decimals of pi. We want to build new accelerators, with the size of the whole Ginebra, the size of the whole terrestrial sphere, the size of our entire galaxy or our universe if we could, to dive nature and find put new names to our new measures. it does not matter if it is totally irrational or not. It would be expected that the next upcoming Copernican Revolution produced a new pendular movement because of the excesses of mathematics and the positivistic sciences have been many. That our science, unexpectedly, received somewhat of its own medicine. Though I hope this time we will able to reach a more intelligent solution. To rediscover and integrate the good things of both confronted and polarized views. Our science needs to rediscover rationality. Whoever wrote this needs to return to algebra class. His entire premise is nothing short of crap. Rich, did you understand what I meant conceptually? I think you didn’t. Archytas actually created the Pythagorean Theorem. Several mathematicians and philosophers agree with you – the irrational numbers are a “convenient fiction” as Bertrand Russell called real numbers – and math professor Luigi Borzacchini wrote an excellent article on the music origins of Western math from Plato and Archytas – a cover-up of real Pythagorean harmonics. Very interesting. Many thanks for your comment, I will look for more info about Archytas and the professor Borzacchini. El problema no es que Rich no entiende lo que dices. El problema es que tu estas confundido y no entiendes algebra. “Irrational” en el contexto matematico no quiere decir “irrational” en contexto de logica. Es una otra palabra que tiene su propio definicion. En contexto matematico un numero es “irrational” si no existen dos enteros cuyo cociente es nuestro numero. En contexto de logica, una conclusion es “irrational” si no sigue las leyes de logica. Son dos palabras que tienen el mismo nombre, pero definiciones diferentes. El hecho que hay enteros irrationales no implica que nuestra conclusion no siga las leyes de logica. El hecho que existen numeros irrationales no significa que la naturaleza sea irrational. Yo no entiendo el álgebra, pero por tu comentario veo que tu tampoco has entendido lo que quiero decir: sí que entiendo perfectamente el significado matemático de “irracional”. No recuerdo exactamente las ideas que dije en este post en concreto, que es de hace tiempo, ten en cuenta que la mayoría d elas veces son ideas que voy desarrollando de forma progresiva, por ello el blog no es fácil de seguir. El tema del Teorema de Pitágoras lo he tratado en varios posts más. Lo de narcisista no viene a cuento, aquí se trata de pensar y discutir sobre ideas, sin tener miedo a equivocarse ni a decir lo que se piensa.